To all the bike racing lovers, ready for your much-loved racing sports as 2019 MotoGP Schedule is announced. MotoGP is the best premier classic motorcycle racing event in the world which occurs every year on different circuits. The Grand Prix motorcycle racing happens from past centuries but in 1949 a full governing body formed as FIM. Federation Internationale de Motocyclisme is given the chance to all riders of the world to showcase their talent. MotoGP happens on different circuits of the world, this year 10 March at Qatar is the beginning of the event. It will go past America, Europe, Asia, Australia and finally end at Valencia GP on 17 Nov 2019. This will be the 71st F.I.M. Road Racing World Championship season in which some major changes will be witnessed. Marc Marquez is the Riders champion of MotoGP 2018 and the Constructors champion in MotoGP is Honda. MotoGP has 6 Constructors of vehicles named as Aprilia, Ducati, Honda, KTM, Suzuki, and Yamaha. French made Tyre Company “Michelin” is the official suppliers to MotoGP. The 2019 MotoGP Schedule has 19 Grand’s Prix 12 will be held in Europe, 3 in Asia, 2 in Americas and 1 each in Australia and UAE. Tech 3 motorcycle racing team will switch to KTM Machines this year, they are ending the 20-year relation with Yamaha. Spanish Team Angel Nieto has announced that they are joining SIC Racing Team, it is the replacement of tech-3 Yamaha. The Belgian team Marc VDS Racing is not selected for the 2019 entry list. 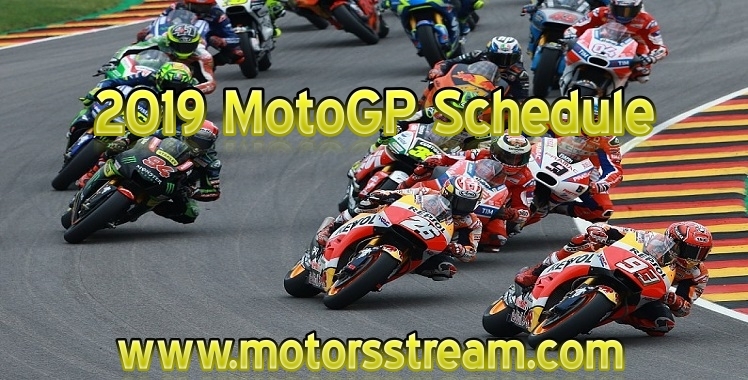 Watch all the races as per the 2019 MotoGP Schedule for more information and related news of drivers. Get all Motorcycle Grands Prix live streaming worldwide on our website in High video quality. Access it from all over the world without any VPN or software.